"Speak the speech trippingly on the tongue" advises Hamlet to the first Player. 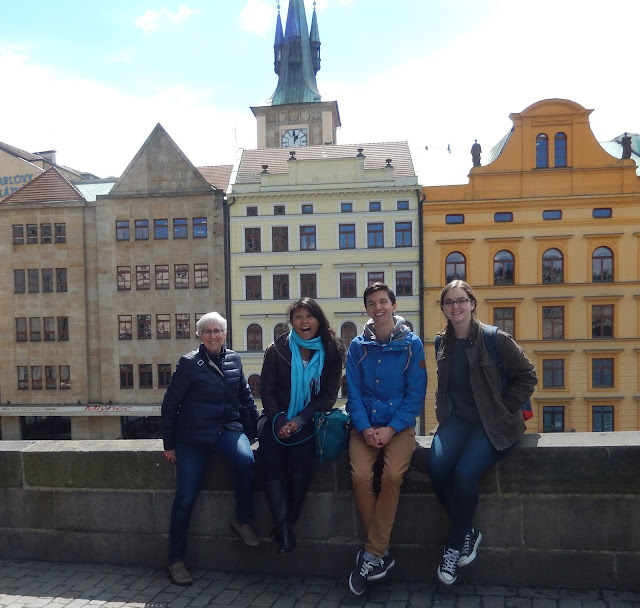 On the weekend of the 400th anniversary of the death of the Immortal Bard, the NESDA team headed to Prague to celebrate the spoken word. There were fourteen of us on the trip, ten students and four adults. Patti and I were staff supervisors, while our social media intern, Carmela, accompanied us to capture the weekend in photos, and Bob came because he goes where I go. I had four NESDA veterans in this second semester squad, all actors, who were keen to reconnect with students from across Europe that they had met in Vienna in December. The organization of this event was seamless. We were met at the airport by the host school's bus (and driver), and transported to our hotel. Each time we had to get to the school, this same bus came to get us, and transported us back. That first evening, since the students wanted to practice one more time before the competition the next day, we ate at the Japanese restaurant in the hotel. 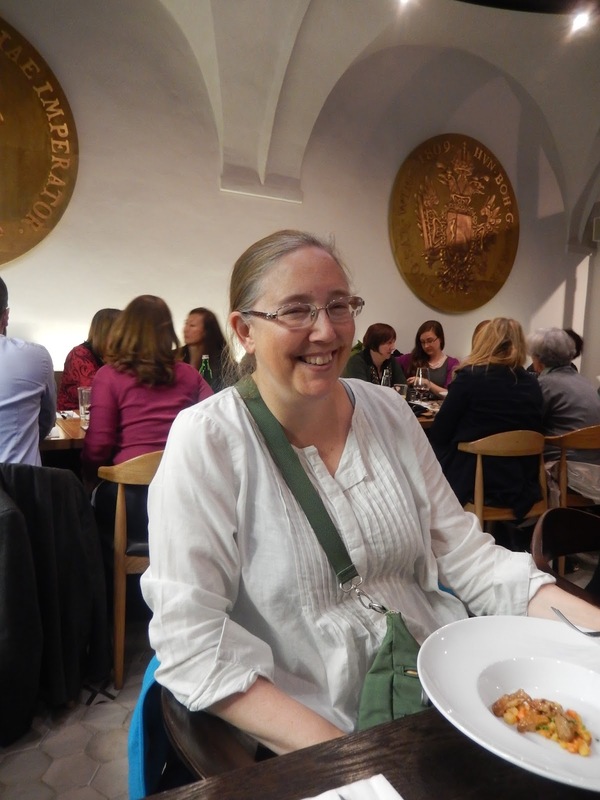 This began another trend of our Prague experience: delicious food, but slow service. 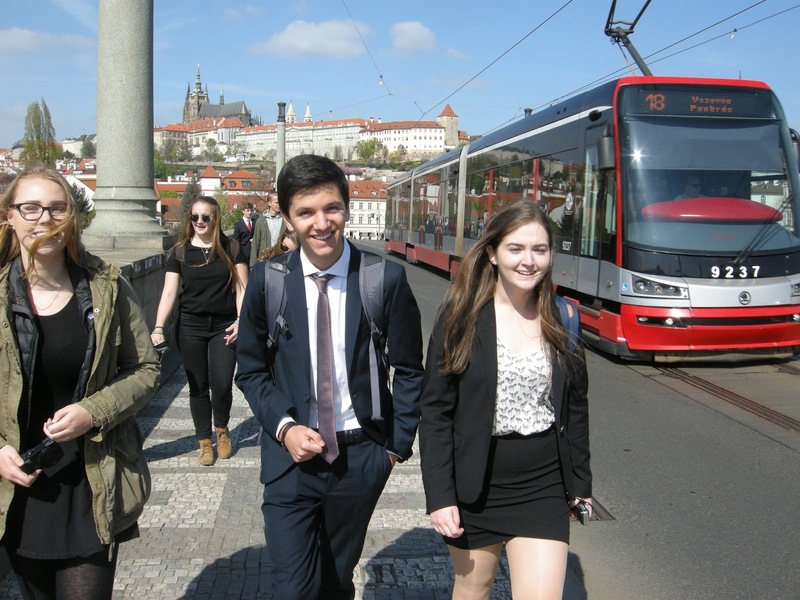 Early the following morning, we were taken by bus to Prague Castle; from there, students from the International School of Prague led us into the old town where we would have lunch. We found ourselves in a lively pedestrian area, full of tour groups. On this beautiful day, Prague was clearly a popular destination. Fortunately, we found a place to enjoy a pizza lunch together, and even had a little time to take photos as we walked. 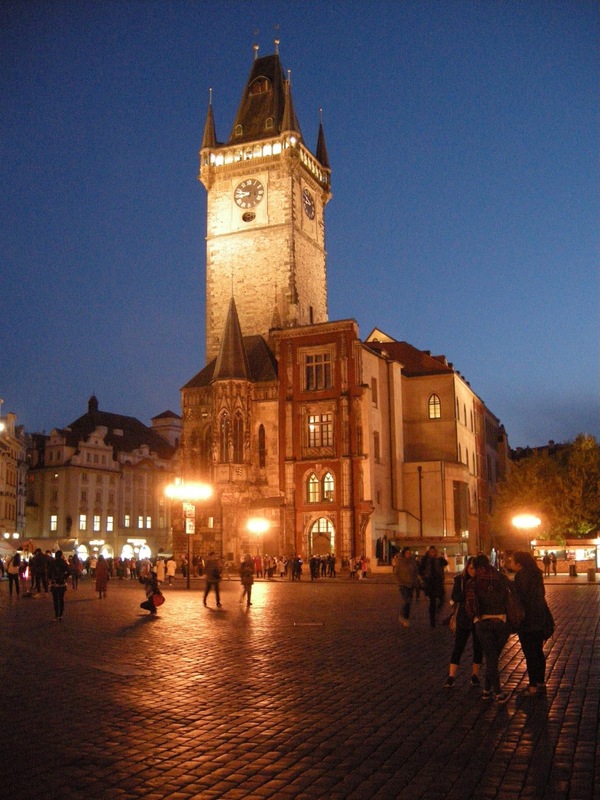 What a gorgeous city Prague is!! 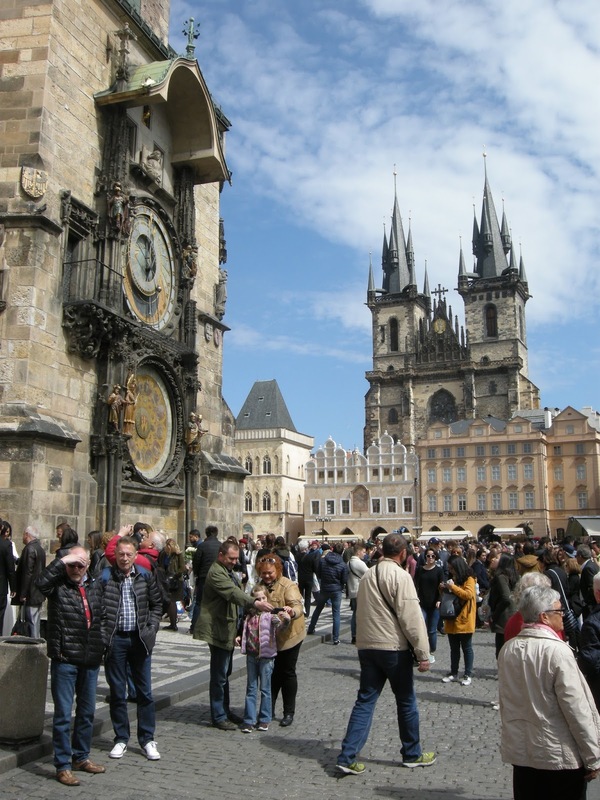 Crowds gather around the astrological clock. A team huddle in the old city. 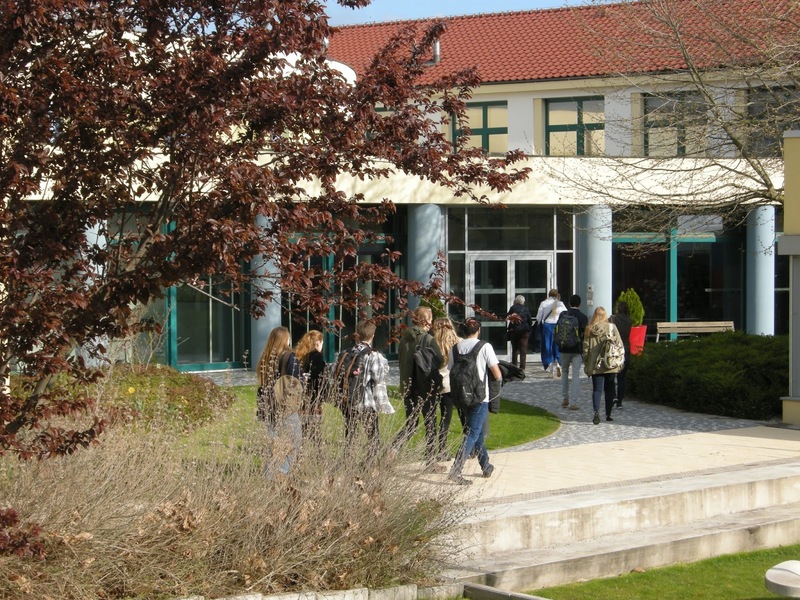 After lunch, we met the other teams and were taken to the suburbs where the school is. 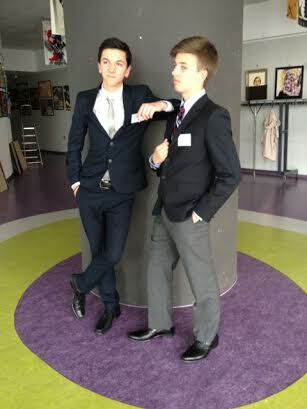 There, we began the competition. Our two debate teams, Rachel and Ellis, and Raphael and Will, had prepared their arguments for both sides of the resolution: Violent civil disobedience can be justified. 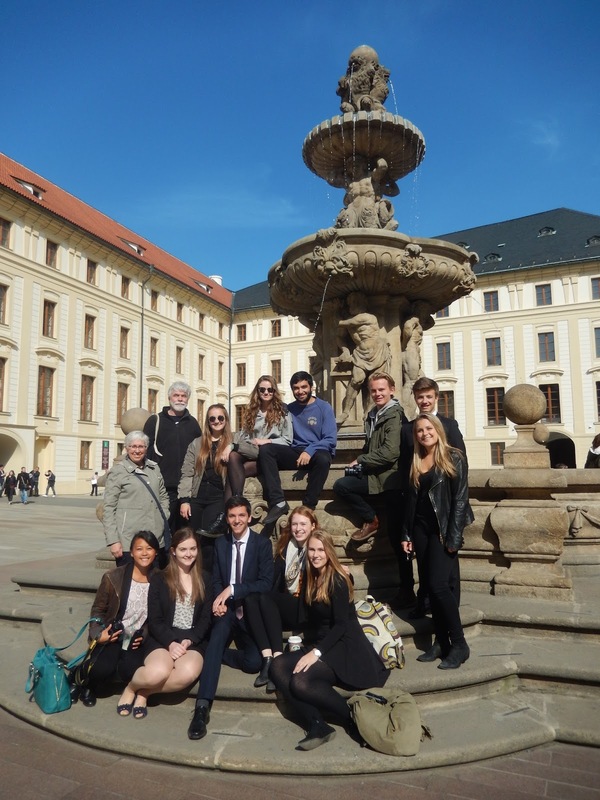 They were all inexperienced in debate and were up against some formidable teams, but they did well, winning at least one of their three encounters over the two days of competition. 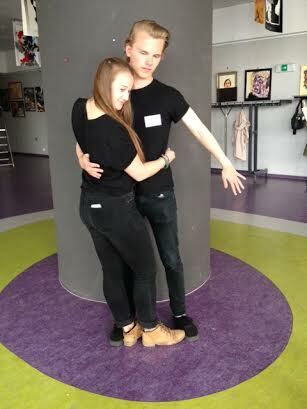 Our actors were more experienced and had rehearsed for months. This semester, the plays had to be light, and ours certainly were: Maggie and Sasha reenacted a piece about two friends "breaking up" over fries in "The Blueberry Hill Accord"; Grace and Kieran played strangers who meet as they both consider jumping from a tall building in "Ledge." (It's really funny–trust me); and Emma played a hapless woman who is seduced by a very large bee, Thunder, in "2B or Not 2B". All of the pairs were worthy of the finals but although two teams advanced to the semis, none made it to the last day. Sasha prepares to read in the finals. In the individual events, we had some success. 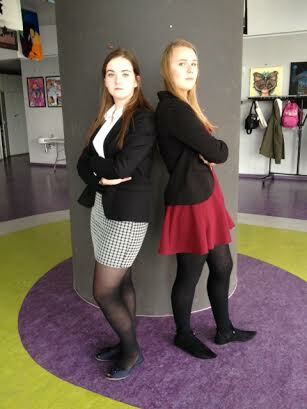 Two of our impromptu speakers advanced to the semis–Rachel and Sasha; Ellis advanced in original oratory; and both Sasha and Ellis moved on in oral interpretation, reading serious pieces about low self-esteem and suicide. Our only finalist was Sasha who read her monologue from "The Most Massive Woman Wins" with passion and conviction. Unfortunately, there would be no medal. There were a lot of talented students to beat and this was not to be our day. 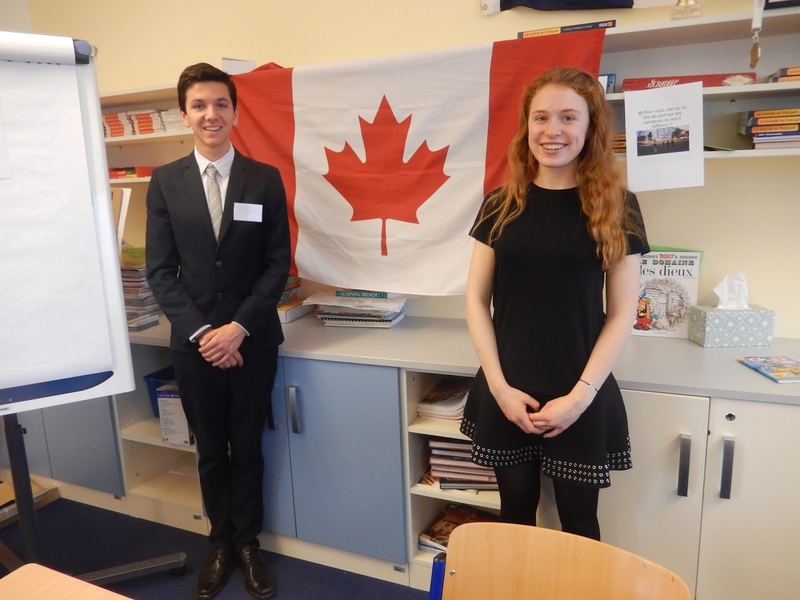 Raphael and Emma posing in front of a large Canadian flag in one of the classrooms in Prague. A moment of pride. We may not have been winners by medal count, but we were in other ways. 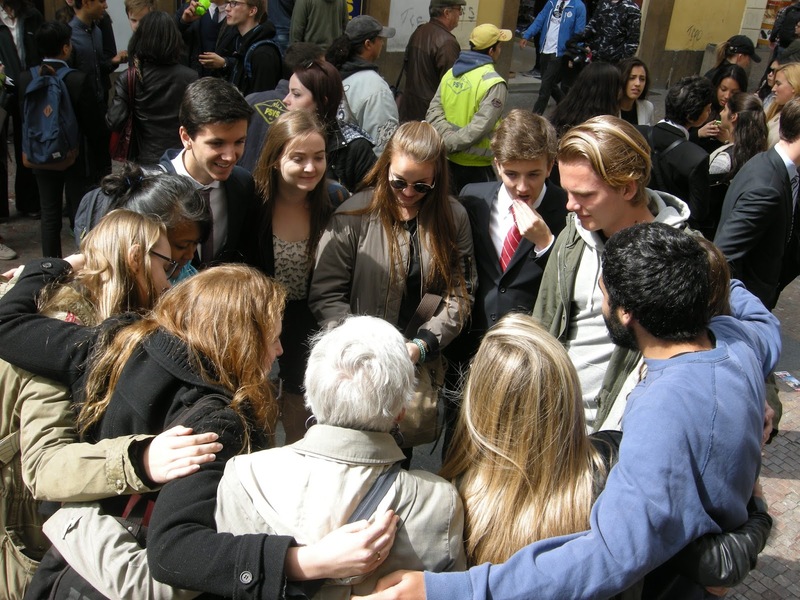 Our group was popular with the other teams, as the students made friends from all over Europe (and Cairo). They were worthy ambassadors of our school and of Canada, although, we had one Iranian-American and one Bahamian among us. In fact, on the morning of the finals, we were greeted with "Hello Canada" from one of the actors. Dinner by the water with the Charles Bridge in the background. Bundled up against the cold. 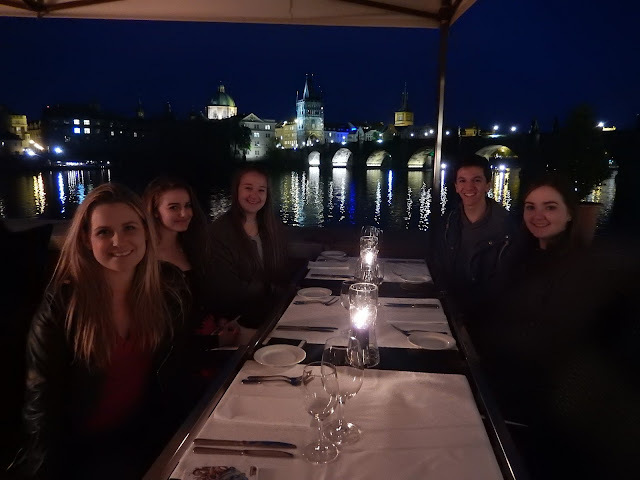 Friday evening, after competing, we found two tables on the water at Hergetova Cihelna, a very good restaurant that Bob had noticed while exploring the city during the day. 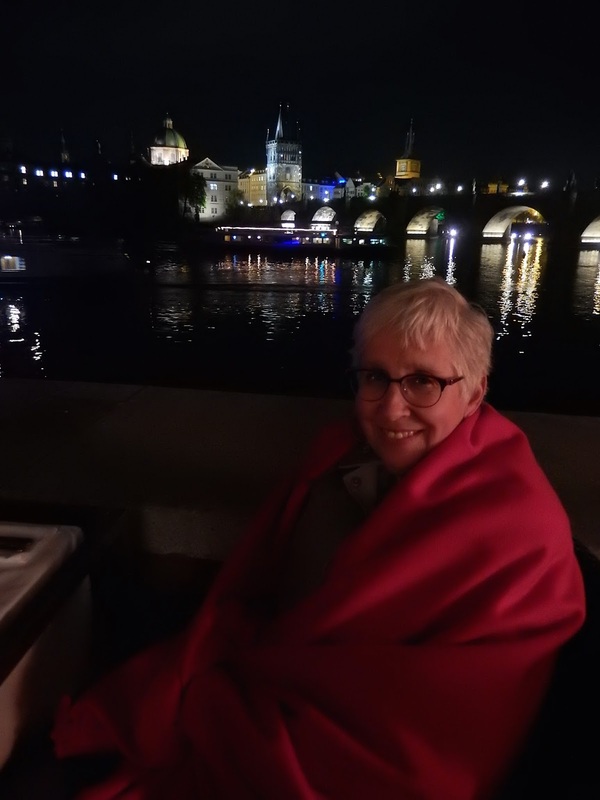 It was a chilly evening, but we wrapped ourselves in blankets provided, and enjoyed the food and the view. It was the best hamburger of his life, Raphael declared. 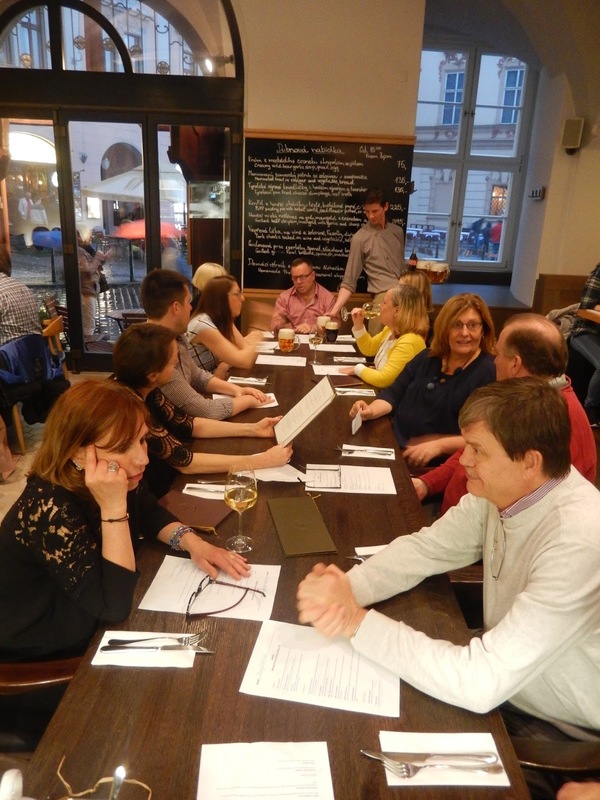 The next night, there was a coaches' dinner where Bob, Patti and I were treated to traditional Czech fare. NESDA is special in that the coaches are very much a cooperative; we all act as judges during the competitions, and take turns hosting. 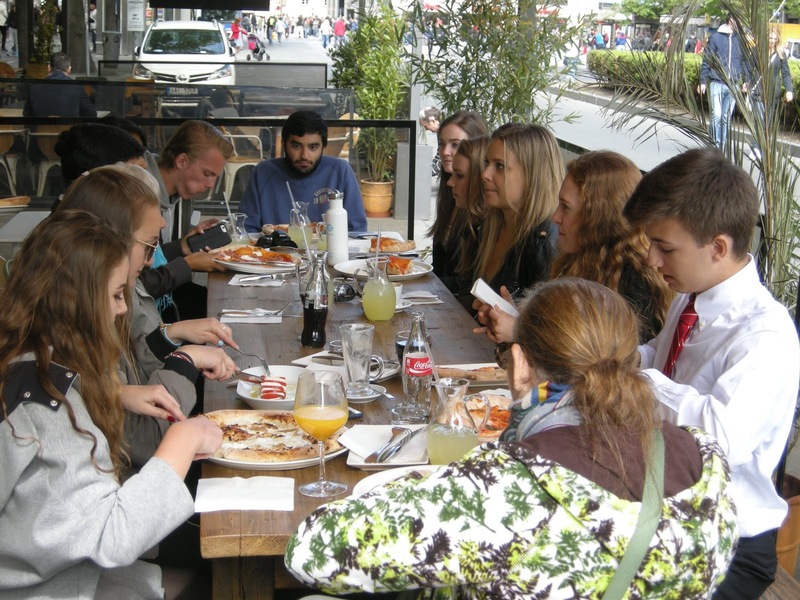 I have enjoyed meeting these people from the International School community. NESDA is in very good hands. 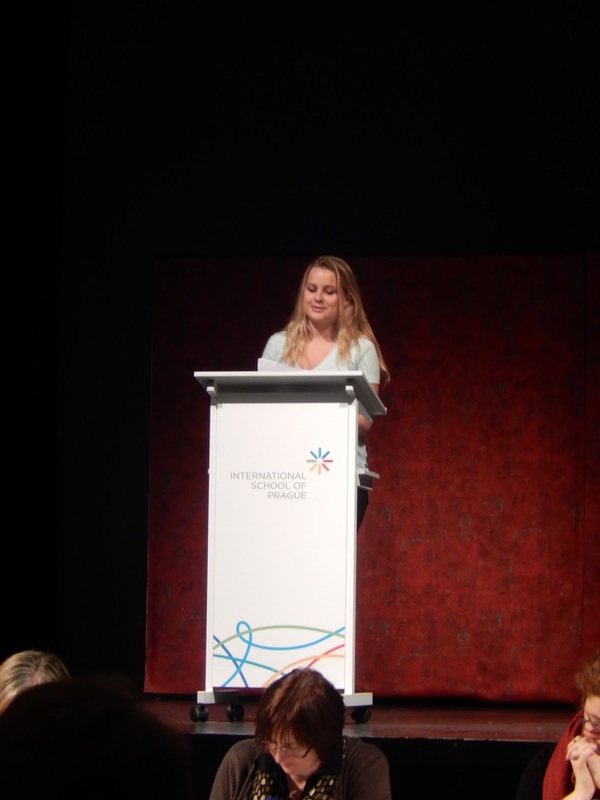 For NJC, Patti will continue to stay involved next year to help with the transition. 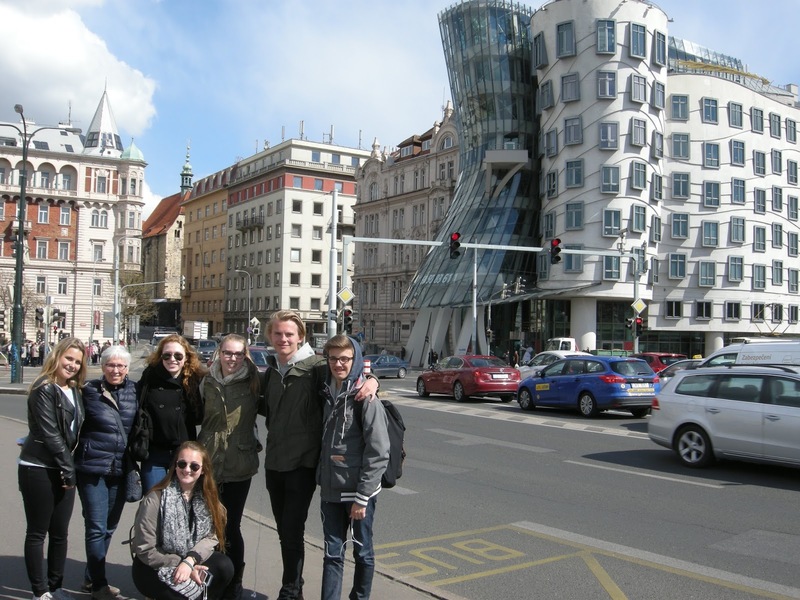 By 3:00 on Sunday, NESDA Prague was over, and we all said goodbye to our international friends. 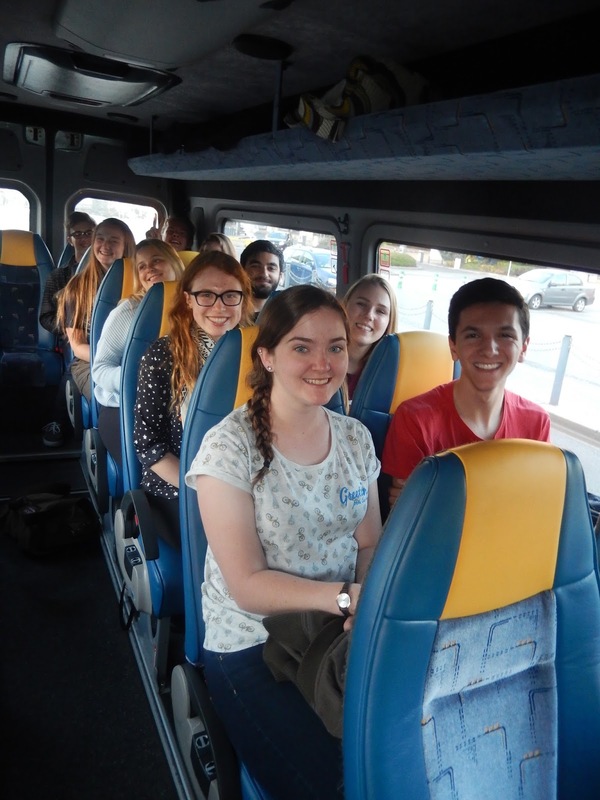 Our NJC team still had over 24 hours left to enjoy the city and that is what we did! Our first item of business was to attend a concert in the Old Town Square at Saint Nicholas Church. 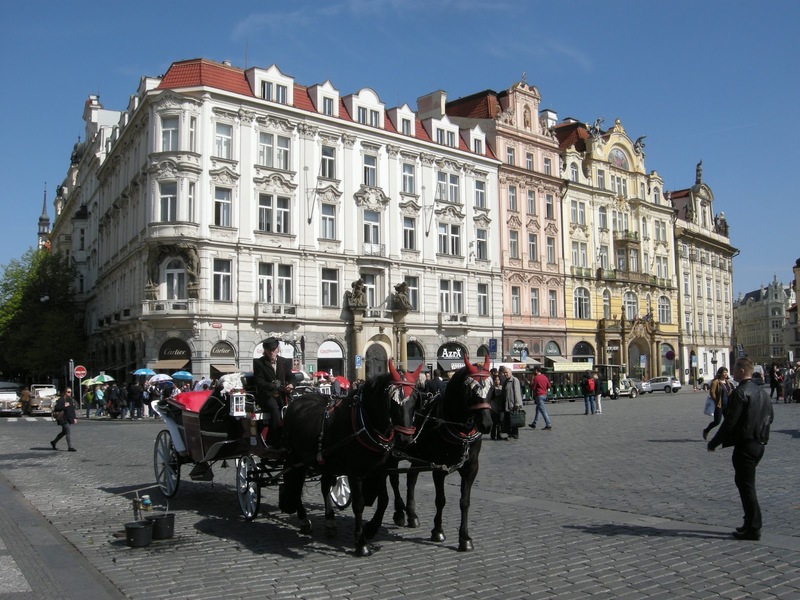 Classical music is played all over Prague and is a major tourist attraction. We chose an oboe and harpsichord/organ performance by Vratislav Vina and Frantisek Stastny who played pieces from Telemann, Bach, Mozart and Handel. 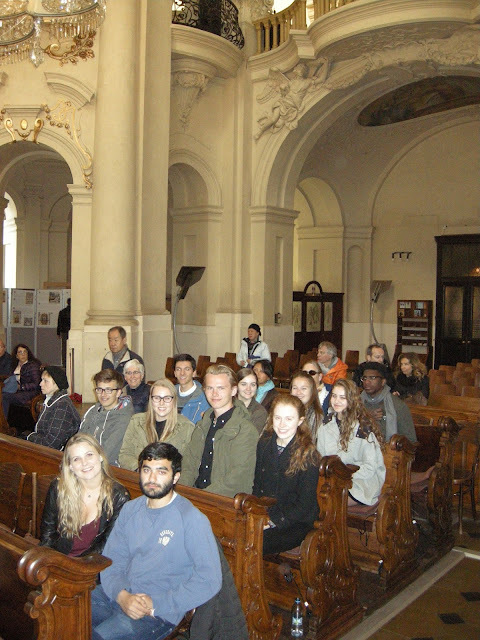 The acoustics of the church heightened the music and we very much enjoyed the hour. 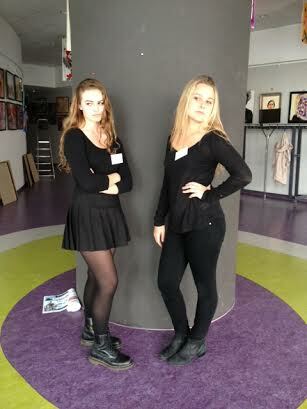 I was pleased to have forced culture on my students. 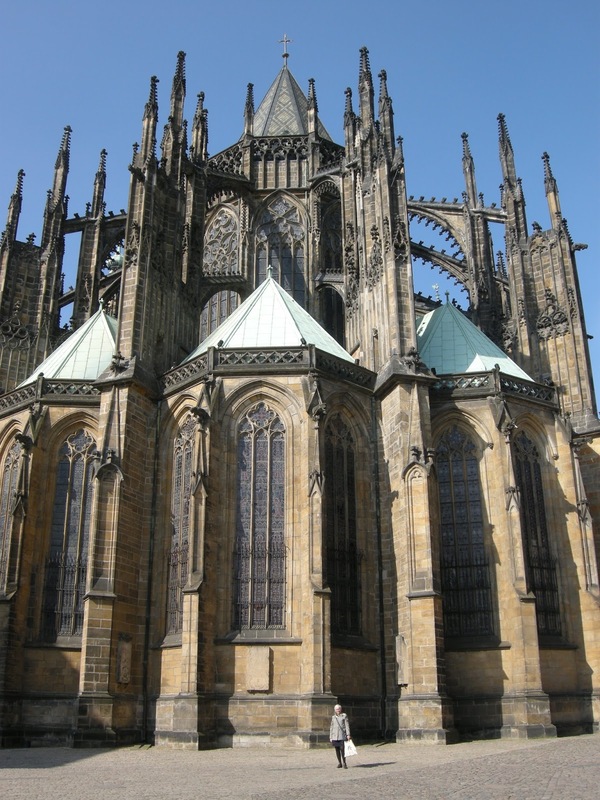 The gothic church, Our Lady before Tyn. After dinner at an Italian restaurant, Bob, Carmela, Patti and I took in the lights on the main square before heading back to the hotel for the night. The students stayed out a little later. 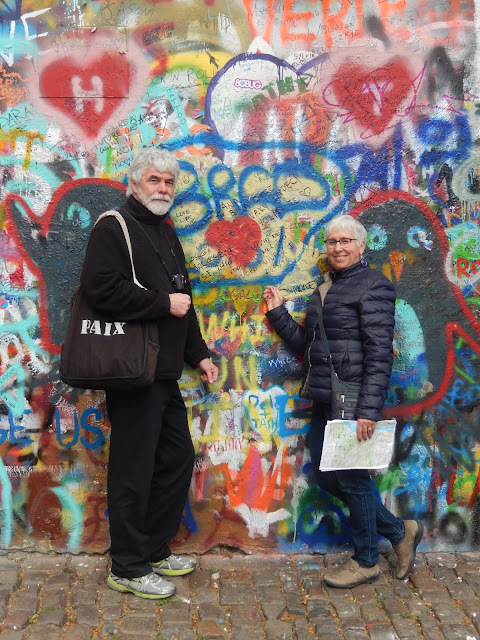 Our final day in Prague was our biggest day of exploration. We began, as before, at the castle, but this time we bought tickets for admission to some of the sites on the grounds. We had about an hour to see what we could. 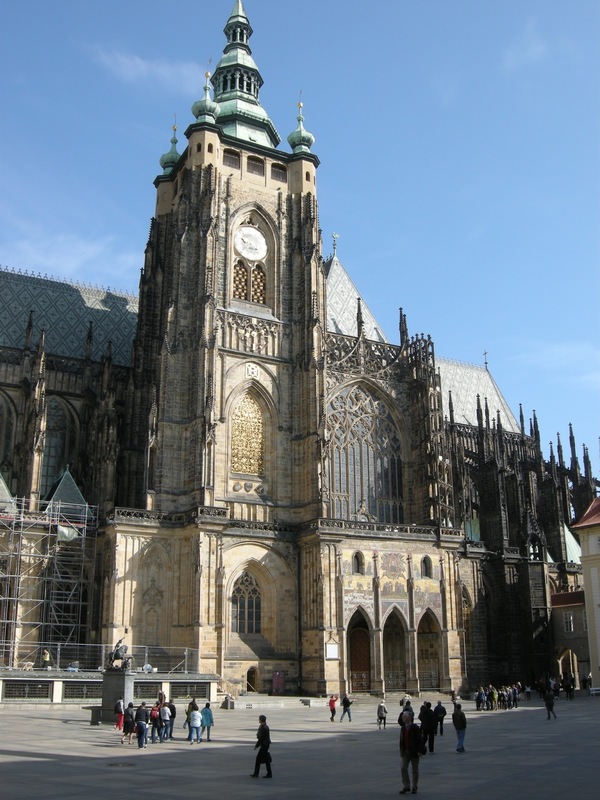 I was keen to enter St. Vitus Cathedral. It is a stunning gothic structure, the largest church in the Czech Republic. 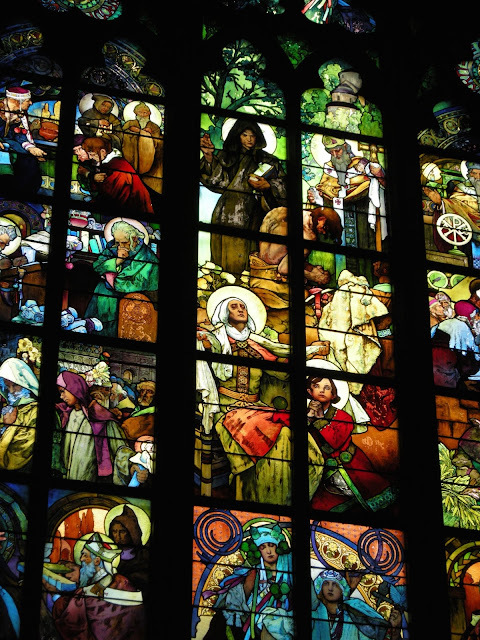 It is renowned for many things, but I was particularly struck by the stained-glass window by Mucha. 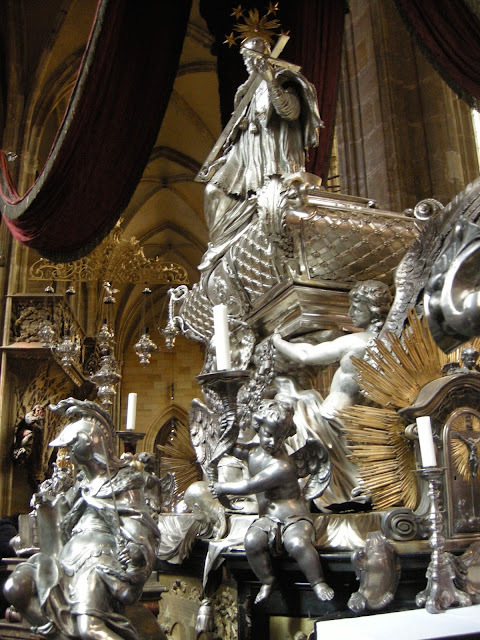 Also notable is the silver tomb of St. John Nepomuk, where the Austrian designer used two tons of silver in its creation. Honestly, I could have spent the entire hour in this magnificent church. Group photo looking over the town. 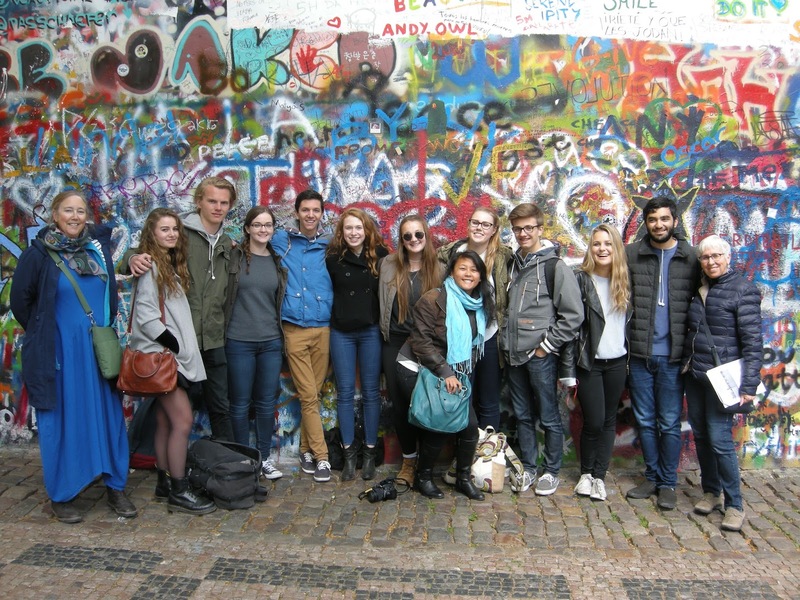 In front of the John Lennon Wall. 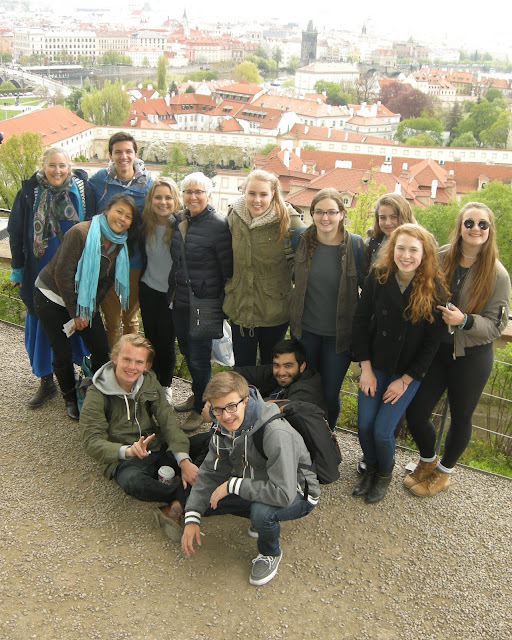 As we descended towards the "New Town" which lies on the north bank of the river Vlatava, we stopped for a group photo. A little later, we posed again in front of the John Lennon wall. We had many group photos taken during this weekend, because we did almost everything together, students and staff. This is the beauty of NESDA. 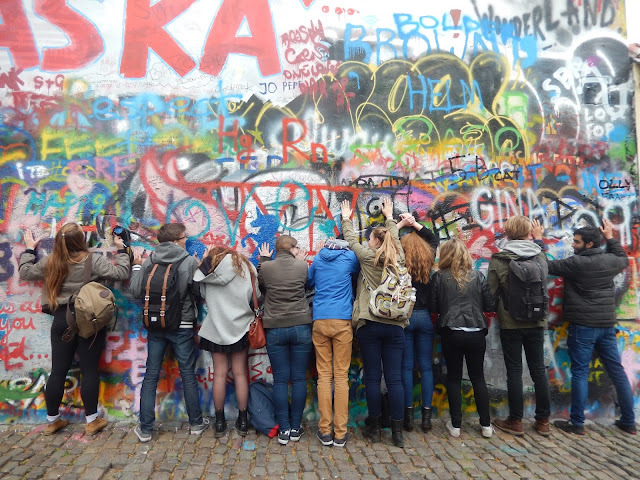 As a sanctioned graffiti wall, the John Lennon wall leant itself to photography, so we had fun there, posing and leaving our marks. I felt compelled to break into song. 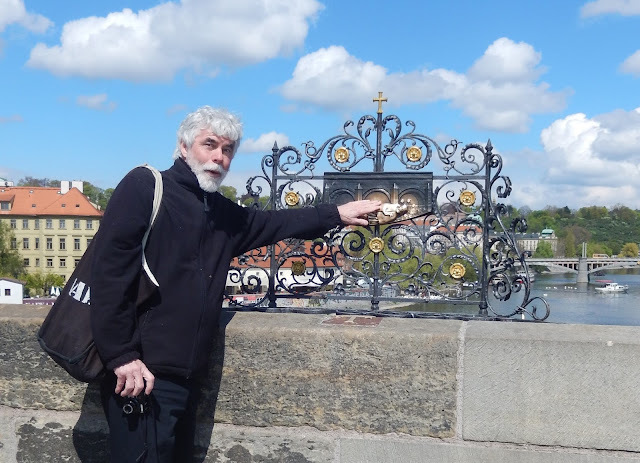 "Imagine there's no heaven.."
Carmela, Raphael, Rachel and I on the Charles Bridge. 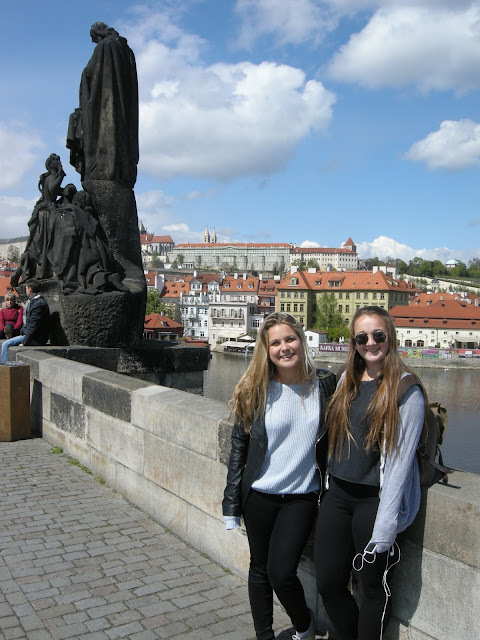 Sasha and Grace on the Charles Bridge, with one of the statues behind them. Bob rubs the bronze figure of St. John of Nepomuk. 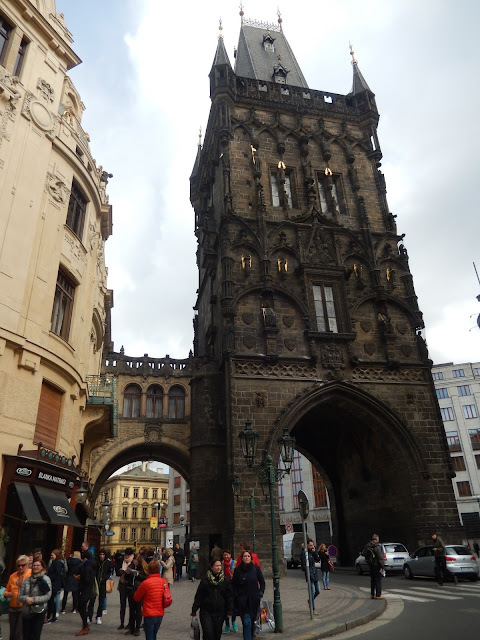 Begun in the 14th century, this iconic bridge is a delight. 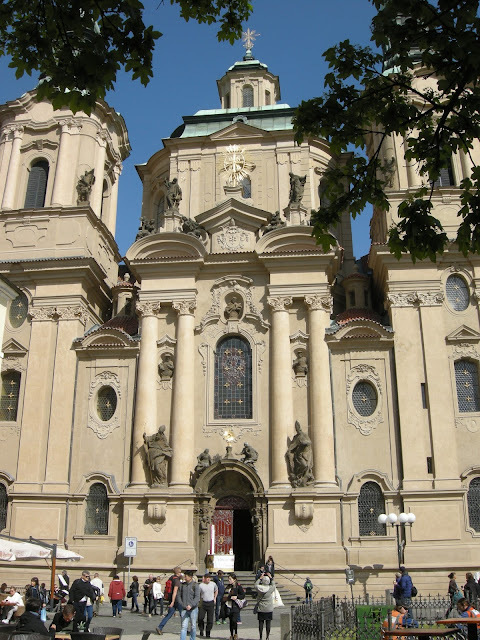 Every few meters, we passed a statue, erected in the 17th and 18th century to honour various saints. 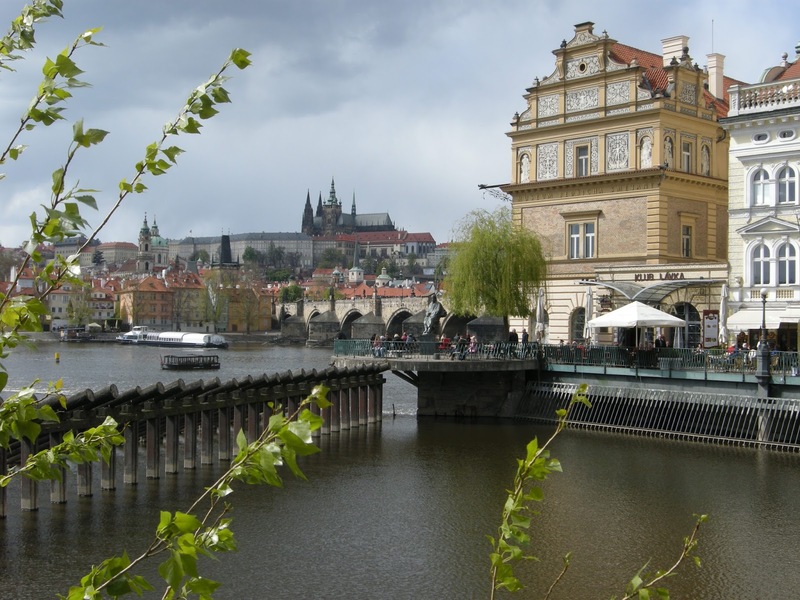 The view towards our Friday Restaurant from the Charles Bridge. As we started our walk across it, we looked back towards the restaurant where we had dined a few days before. Then Ellis looked in front of her and found us a floating restaurant for lunch, so we ate together one last time. We seven followed Bob through Prague. That's the Frank Geary Building behind us. 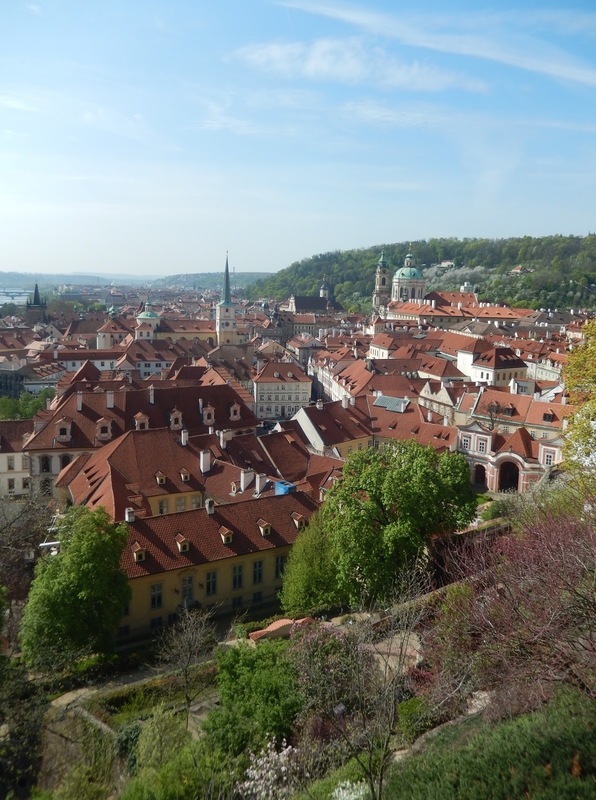 In our final few hours in the city, Bob led seven of us through the streets of this beautiful city. 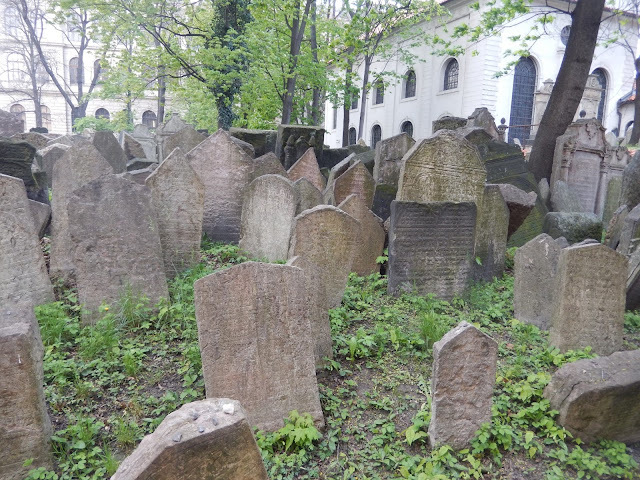 We took photos of the wonky Frank Gehry building, the Powder Gate and the Old Jewish Cemetery, among many other landmarks. By 17:00, we were on our way back to our hotel, where we met the rest of the group who had amused themselves by walking on water while we explored the city. Reunited, we headed to the airport. 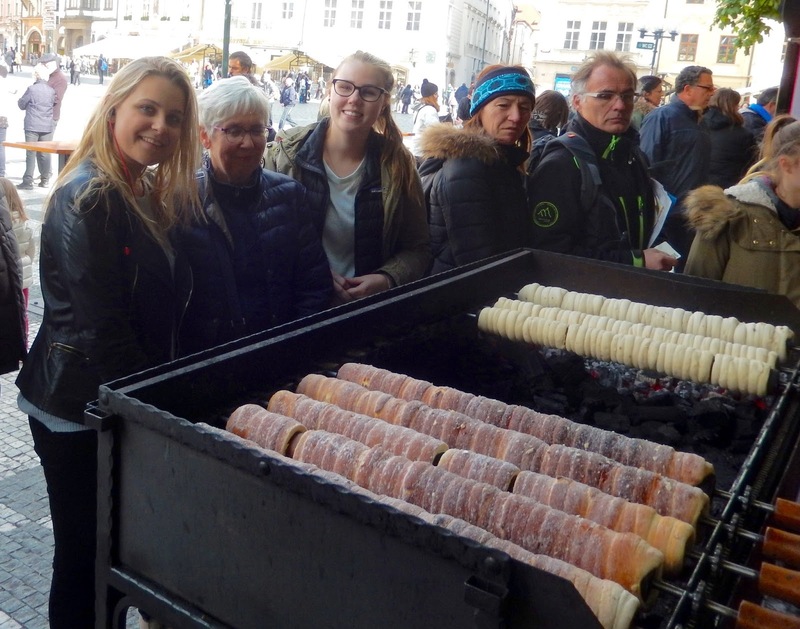 Sasha, Ellis and I tried trdelnik, Prague's spiral shaped sweet pastry. 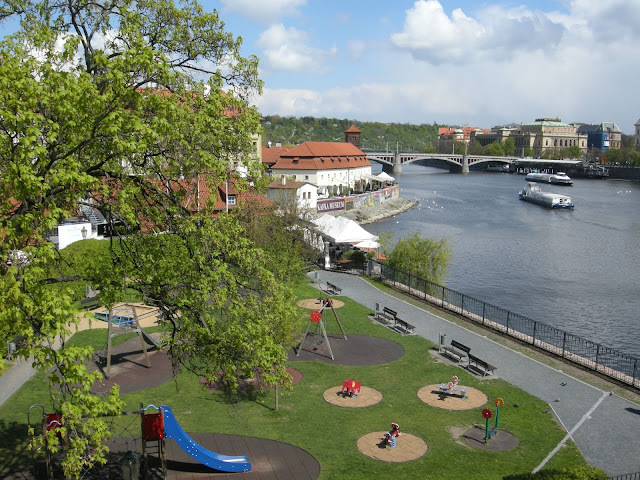 Needless to say, NESDA Prague was a wonderful interlude for all of us. I have to say that my trips with my NESDA teams have been the highlights of our group travel this year.